If you wonder why I post virtually the same recipe twice, it’s because I don’t know what I’m doing. I thought the last salmon Quiche was pretty good, but I wanted to adjust it a bit – kick the seasoning up a bit, add more veggies, etc. I want it perfect – hard for someone who really can’t cook. As Saturday was rainy and I was up early with the kitchen to myself, I thought I’d have some fun experimenting. There’s also the thrill of wasting perfectly good food. I don’t gamble – I guess this is my substitute. Here’s my revamped version – with pics included. As I essentially doubled the last recipe, I was going to need 6 of the little baking dishes. 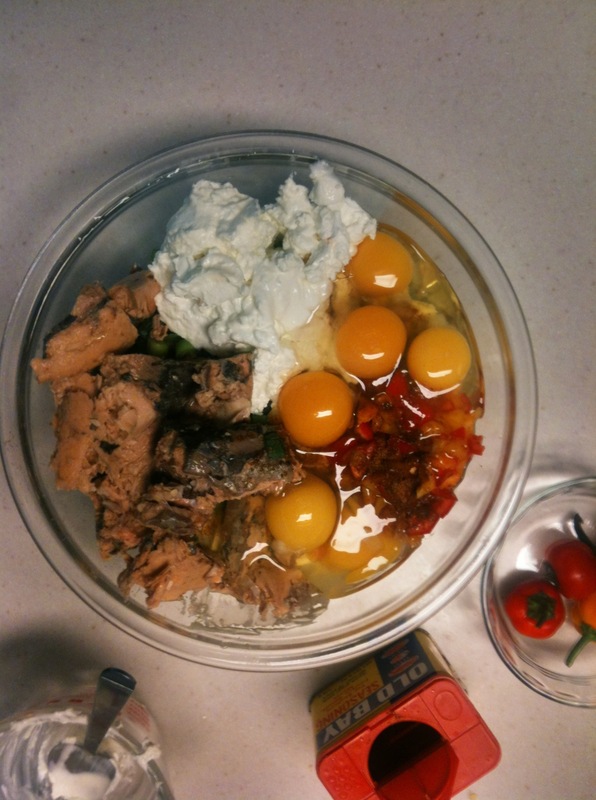 I first added the cream cheese to my mixing bowl and threw it in the microwave to soften it. unfortunately, I put it in on high and heard a small explosion that let me know that perhaps I was nuking it a wee bit too long. 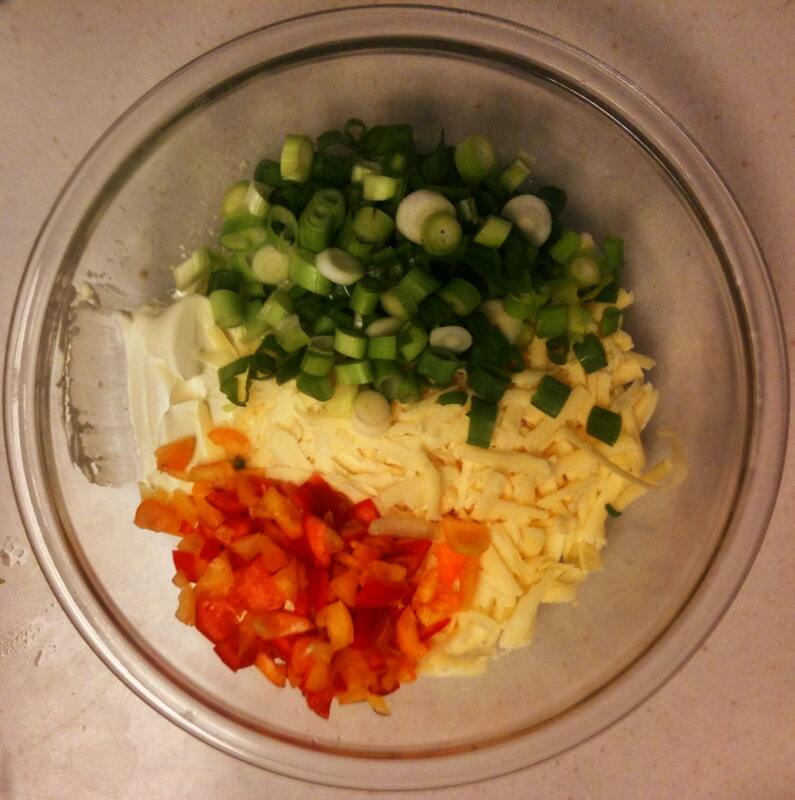 It was soft enough at this point so I grated the cheese inside the same mixing bowl, then threw the chopped scallions and peppers in. 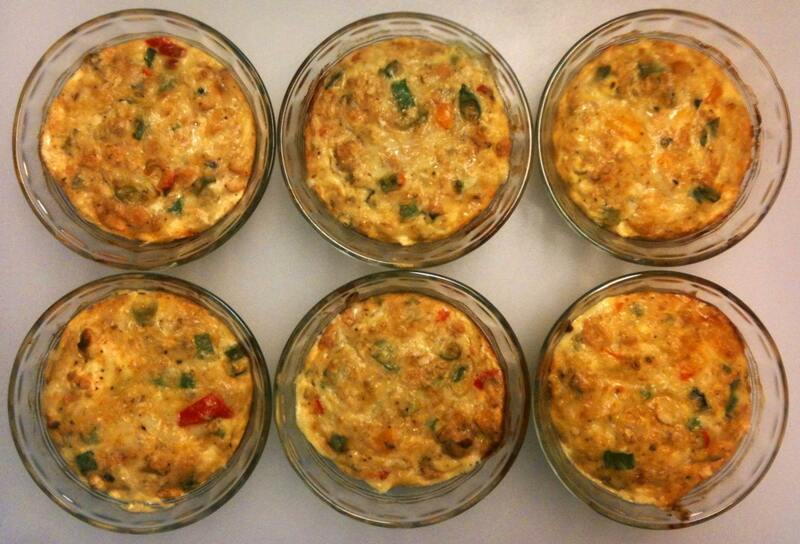 After the mixing, perhaps not quite as pretty, but hey – you gotta break a few eggs to make a Quiche – right? As I tell my daughter ad nauseam: ‘cleanup is part of every project’. I take this to heart. 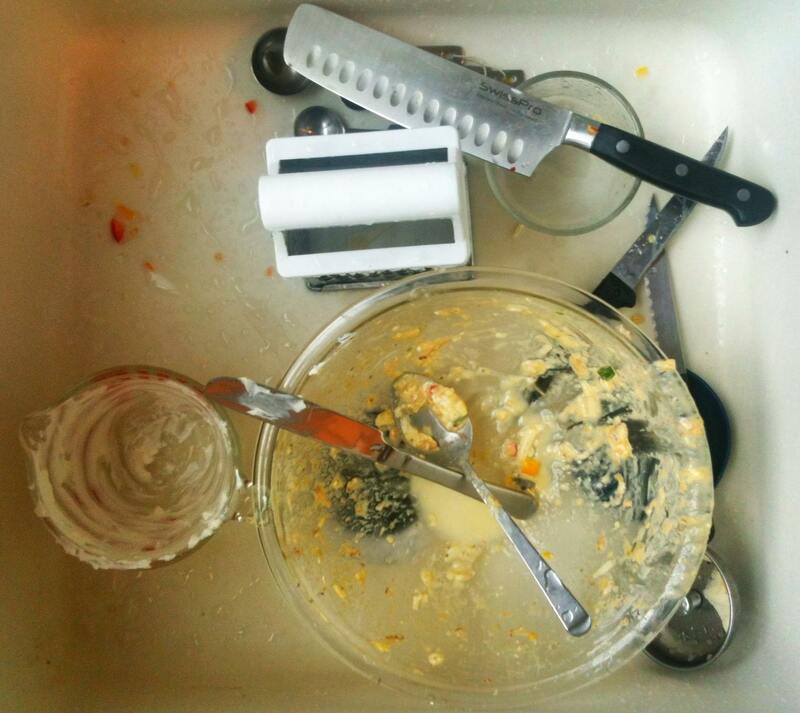 I am not some TV cook that has some poor slob clean up after me as I happily pull one clean bowl after the other out of a cupboard, utensil after utensil piling in the sink. Real people in the real world clean up after themselves – or get the ‘stink-eye’ from the family member left to clean up their mess. I’ve done way worse than this. Special Extra Super Bonus! Nutrition Information! Personally, I liked this one better than the last ones. 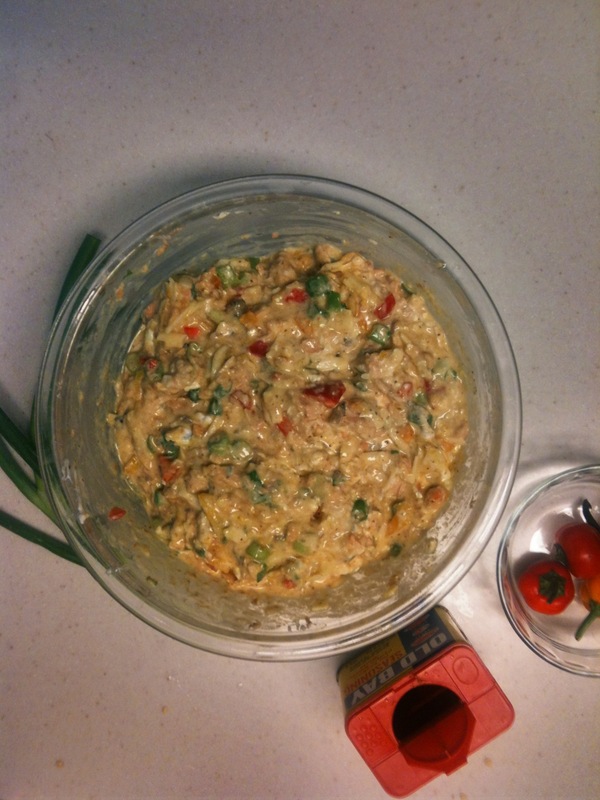 The scallions – a substitute for onions as we were out of them – worked fine. The peppers added an additional crunch and flavor note. They also have a ‘body’ to them in that you can take them out of the containers and they don’t fall apart, which makes them portable – a nice extra. Still…there’s something missing. I tried offering it around. My younger daughter gave me a look like I was trying to sell her a used car. I was finally able to get her to take a taste, and she told me she didn’t like it. OK – fair enough. I brought the Quiche to my wife and daughter and my younger daughter came in to tell us she changed her mind – she liked it – and she had some more. My wife took a taste: “too salty’ was all I got out of her. 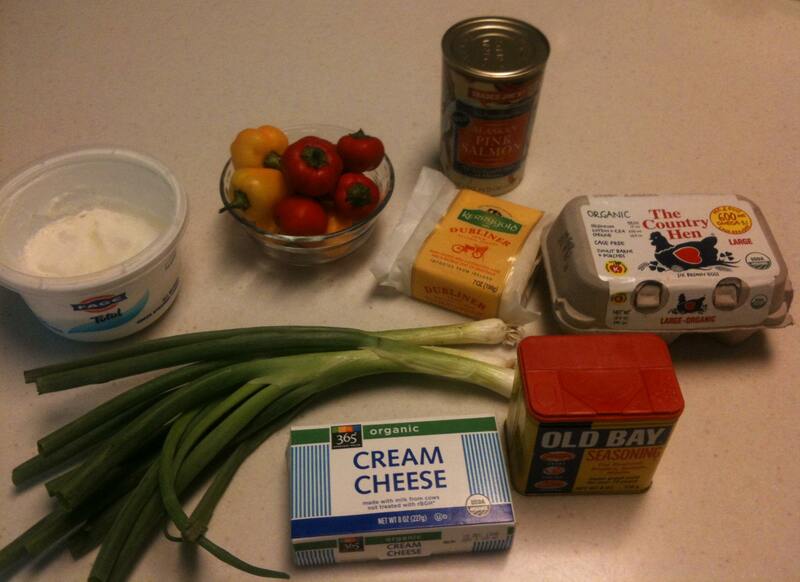 She might be right – maybe 4 teaspoons of Old Bay was too much – maybe next time 3 would do? My daughter took a taste and gave it a thumbs up. I asked both if they thought it was missing anything and I didn’t get an answer – they were too busy involved in some drama having to do with school supplies, I believe, to give my Quiche the attention it deserved. The verdict: pretty good. Next time I’ll pump up the peppers and maybe pull back a bit on the Old Bay. I’ll give myself a B.